There’s nothing like saying, “Will you marry me?” or “I do” to bind and celebrate your love! Nowadays there are so many ways to propose and tie the knot, that we’ve seen more and more couples opting for more radical experiences than the traditional wedding bells. If you’re one of these couples, we’d love to invite you to one of the most extreme marriage proposals and extreme wedding ideas ever: skydiving! Yes, it’d be a dream to jump solo into the arms of your loved one for your first skydive being your wedding. However, there’s a lot more to skydiving than just jumping out – there’s the equipment, emergency procedures, flying your body, flying the parachute, and landing. If this is your first time, then tandem it will be. Speaking of tandem, for safety reasons, each tandem pair must jump out separately. That means no freefall with your wife or hubby-to-be. However, we are your event planner and have options in store to make the day as magical possible! Keep reading! Although a freefall skydiving wedding or proposal isn’t in the cards, you can still recite your vows riding up in the airplane, then celebrate with a skydive, kiss, jump out, then more kissing when you land! Trust us, it’ll be the #bestkissesever! Yes, yes, YES! This is possible and been done before! We’ve had several friends tie the knot in the beautiful blue skies! Such as our friends in George and Celine in California! When you are each licensed, then there is more possibilities to fly together. Depending on your experience will depend on how big you want to go. Our friends in Cali were uber experienced and so were their friends. It can just be the two of you in freefall, the 2 of you with a skydiving justice of the peace, or you can create shapes in the sky with friends. 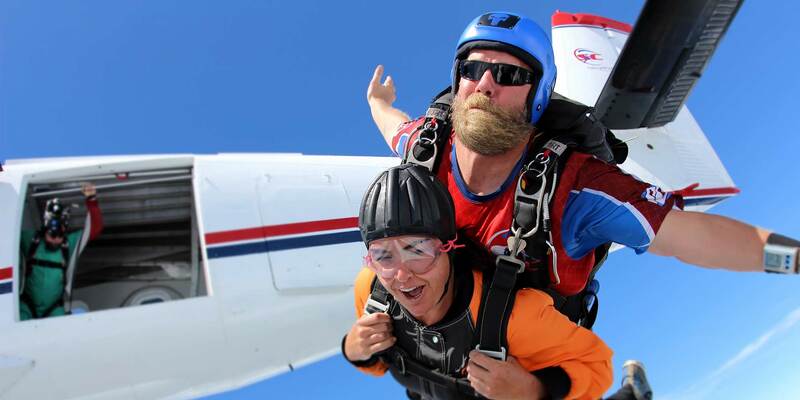 When you’re planning your skydive wedding, you want to make sure that you choose the best day for you and your guests. When it comes to making big plans, keep in mind that Skydive Carolina is busiest on summer weekend days. If you want to make sure you and your guests get a more intimate experience, book with us on a spring, summer, fall or winter weekday! 1) Too loose of clothing can cause the clothes to whip your body at about 120mph which is quite painful! 2) Bulky clothes or clothes that untuck or become loose can get in the way of operating the equipment properly. 3) Many times we have our students plan on a slide-in landing and we wouldn’t want you to ruin your clothes! So jumpsuits – they’re tip-top skydiver cool! Note: when you make the reservation, let us know your plans so we can help you coordinate! We will keep this super top secret among our staff so no surprise will be ruined. After checking in and taking the training class, you will be suited up just like our normal procedures. We will have the proposer jump out first so they will land first. After landing they will be handed the ring (as we’ll keep that safely tucked in the hands of one of our team on the ground), and prepare to pop the question right when the lucky person lands. And there’s more! If you’d like, we can have a “Will You Marry Me” banner custom made to have as your loved one lands and can see the awaiting surprise on the ground. As there are quite a few steps in the wedding, we suggest to have the bride and groom come out a month or so prior to see the facilities and plan the flow and decorations. Then we recommend having them return the day before to take their class – that way they can be more focused for their skydiving wedding! The ceremony will be held in a designated area at our facility and after the vows and recession, the newlyweds will gear up and jump. No matter if this is your first time or you’re licensed, if you’re proposing or having a skydiving wedding, you won’t want to miss a moment! Be sure to get it – proposal/vows, freefall, and celebration – on video! We have an experienced crew at Xtreme Media Services to help you on your big day! We love helping our guests plan their skydiving proposal or wedding and know there’s a lot that goes into making the day perfect. Please feel free to contact us if you’re interested in proposing or having a skydiving wedding!